So What of First Base in Milwaukee? In case you missed the news yesterday, there was a free agent signing reported and quickly announced following the reveal of the 2016 MLB Hall of Fame class. 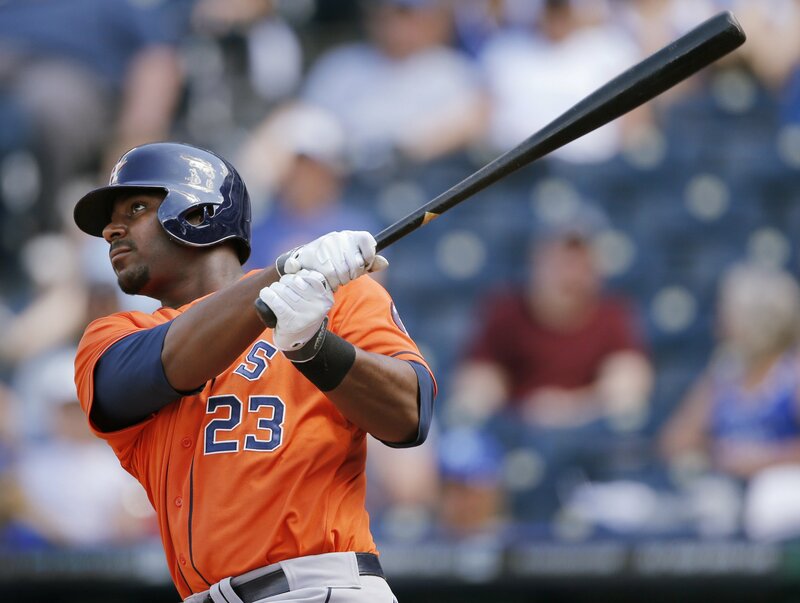 The Milwaukee Brewers have signed free agent first baseman Chris Carter to a one-year contract. To make room on the 40-man roster, the team designated catcher Josmil Pinto for assignment. The announcement was made by General Manager David Stearns. Carter, 29, has hit 90 home runs over the last three seasons (29, 37, 24), which ranks eighth in Major League Baseball. He started 112 games for the Astros this past season (105 G at 1B, 7 G at DH) and led the team in walks (57). Carter was a key component in the Astros capturing an American League Wild Card spot in 2015 as he batted .353 (12-for-34) with 6 HR and 10 RBI over the team’s final 15 games, beginning September 18. Of anyone with at least 35 plate appearances during this stretch, Carter led the Major Leagues in OPS (1.376) and slugging percentage (.971) as the Astros edged the Angels by one game to earn a postseason berth. Carter continued his hot hitting into the playoffs as he batted .294 (5-for-17, 3 BB) with 1 HR and 1 RBI. He started at first base in all six of Houston’s postseason games and fell a triple shy of the cycle in Game 3 of the American League Division Series vs. Kansas City (3-for-3, 2 R, 1 RBI). Originally selected by the White Sox in the 15th round of the 2005 First-Year Player Draft, Carter is a career .217 hitter in the Major Leagues with 109 HR and 280 RBI in 528 games with Oakland (2010-12) and Houston (2013-15). After trading both incumbent Adam Lind and his primary backup Jason Rogers in the month of December, the Brewers had a sizable hole at first base. Enter the large-framed Carter. Carter packs a punch at the plate with his prodigious power potential. There exists no doubt to his ability to clear Major League fences…when he makes contact. What they didn’t, and shouldn’t, tell you in the press release is that Carter finished with a .199 batting average in 2015, even with that final two-week flurry. He also struck out 151 times in 391 AB. Carter once led the league with 212 strikeouts back in 2013. It’s not all negative though. His on-base skills are existent as he still walked 57 times last year to finish with an on-base percentage over .300. It’s not great, but let me frame it for you. Despite a batting average between 50 and 60 points lower, over the last two seasons he still got on base at a better clip than, for example, Jean Segura (OBPs of .289 and .281, respectively, over those years) and Scooter Gennett (.294 OBP in 2015). But they don’t exactly have the power that Carter does. 90 home runs over the last three years (including a high of 37 in 2014) is what keeps Chris Carter in the big leagues. Sure, Minute Maid Park in Houston has the Crawford Boxes which help right-handed hitters, but as we all know Miller Park isn’t exactly a pitcher’s paradise. He’s not considered a good defender, but neither was Adam Lind who turned in a good year with the glove in 2015. Perhaps there’s something to coaching up a bit on defense. At the very least Carter’s 6’5″ frame (and resultant wingspan) offers a big target for the other Brewers infielders to target on their assists. Finally, it must be mentioned that Carter left the Astros by way of non-tender as this is his first off-season of arbitration eligibility. There obviously won’t be a hearing as he is signed to a $2.5 million deal for 2016 (with an additional $500 thousand in incentives), but he’s under team control for longer than just 2016. If he proves capable but not quite flippable, the Brewers could continue to hold onto him for the next couple of years. Then again if Carter has the bounce-back season he envisions, perhaps he’ll be under some other team’s control after a mid-season trade. That’s the other benefit too many people are overlooking. Call it the “Billy Beane” if you want to. The Brewers’ chances of winning the World Series in 2016 are admittedly between slim and none. That said, if you get a short-term asset like a Carter to realize his full power potential before the July 31st trading deadline, he could prove a desirable asset to a contender at which point you could flip him for additional young talent to continue feeding the timeline of future contention. As for the worst-case scenario? Carter’s batting average drops even lower, he strikes out even more, he still hits some #dingerz, and the Brewers non-tender him next off-season after spending a paltry sum for his services. This is pretty much a can’t lose signing because even the worst-case scenario isn’t the end of the world. That’s part of the beauty of one-year deals. I think the team will benefit from the presence of Chris Carter being on the field in Brewers blue this year. Where it goes from there remains to be seen but as fans let’s enjoy the power while we can and let GM David Stearns worry about the fallout down the road. Rumor: Brewers In Trade Talks to Acquire Papelbon? According to a tweet that came in just after midnight CT on Friday morning, the Brewers are in “serious discussions” to acquire Jonathan Papelbon from the Philadelphia Phillies. Sources: Milwaukee in serious discussions with Phillies to acquire Jonathan Papelbon. Unclear if Brewers are on Papelbon’s no-trade list. The Phillies have been selling off several of their high-priced veterans, and Papelbon fits that M.O. The 6’4″ veteran closer is set to make $13 million in 2015 and has a vesting option for 2016 as a part of his contract as well. The Brewers did just save ~$9 million when they traded Yovani Gallardo, so conventional logic would seem to infer that the Phillies might be paying a portion of Papelbon’s contract in any deal. The now 34-year-old Papelbon saved 39 games for a Phillies team that only won 79 all season. He pitched to a 2.04 ERA in 66.1 IP. He struck out 63 batters and walked just 15. In stark contrast to the outgoing Brewers closer of 2014, Francisco Rodriguez, Papelbon gave up only two (2) home runs last year. His FIP (2.53) and WHIP (0.905) are encouraging peripherals as well. Papelbon does have a 17-team no-trade list, but it’s unknown whether the Brewers are on the list. An acquisition of Papelbon would certainly satisfy Doug Melvin’s oft-stated desire to have multiple guys in the his bullpen who have experience closing games. In fact, Papelbon was a rumored target for the Brewers last season before they ultimately acquired Jonathan Broxton from the Cincinnati Reds. At the time, the idea of Papelbon in Milwaukee was panned due to the financial commitment due him. For the record, his 2016 option (also at $13 million) vests if Papelbon finishes 48 games in 2015 as that would bring his two-year total up to 100. As often happens when one baseball writer breaks news, others react to it by checking in with their own sources and then share what they’ve learned. So far today, that role has been filled by FoxSports.com’s Ken Rosenthal and ESPN.com’s Jayson Stark. Source: #Brewers on Papelbon’s no-trade list. Talks with #Phillies have picked up in recent weeks, but deal still not close. For #Brewers, #Phillies to make Papelbon trade, they would need to agree on $$$ going to MIL and players to PHI – and secure Pap’s approval. To this point, none of those things have occurred. 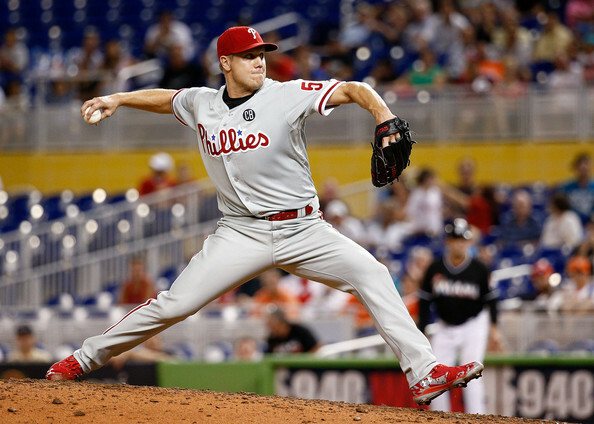 But deal certainly not out of question, given #Phillies’ motivation to move Papelbon. #Phillies’ Papelbonhas not been approached about waiving no-trade to #Brewers, per source. Sign that talks are not in advanced stage. So all that seems to counter, to a degree, what Jeff Passan originally reported. However, Jayson Stark then chimed in. As first pinpointed by FoxSports.com’s Ken Rosenthal and Jon Paul Morosi, the Brewers followed through on my report from early last week and are reportedly on the verge of trading away homegrown starting pitcher Yovani Gallardo to the Texas Rangers. #Rangers on verge of trading for #Brewers’ Yovani Gallardo, sources tell me and @jonmorosi. Gallardo, as you may recall, became the Brewers’ career strikeout leader late in 2014 and was on pace to overtake several statistical categories in Brewers history in the near future. It now appears as though the man we call “Yo” will finish where he currently sits. I’m writing to discuss why I think this trade went down, some of the logistics without yet knowing all the names involved for sure, as well as my generalized thoughts about trading Gallardo from a macro level. First, the Brewers are basically maxed out on their payroll as the day begins. Principal owner Mark Attanasio has been flexible over the years in adding payroll in season when the chance to compete is there. Just look at 2014. He authorized acquiring Jonathan Broxton (the likely closer to begin 2015) and Gerardo Parra (a pricey current 4th outfielder) after all. But entering a season where they sit after avoiding arbitration with all three of their eligible players (~$97 million committed to 12 players per Milwaukee Journal/Sentinel beat writer Tom Haudricourt), it’s not that far of a stretch to understand why Attanasio might want to trim a little payroll fat. Gallardo is set to make $13 million in the final season of a six-year, $42.5 million contract he signed before the 2010 season. This is also pretty strong evidentiary support of the idea that the Brewers had no plans to offer Gallardo another long-term contract or even a qualifying offer after the season. That’s just one of the logistical points of this situation. 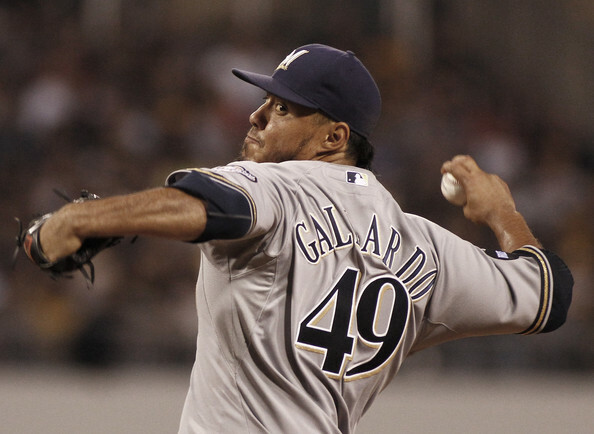 Another that I’ve been told is that the Brewers might not be moving all of Gallardo’s $13 million. There is chatter that they’ll be paying a portion of his deal. That’s normally done to offset the cost to the acquiring team, thereby increasing the return in quality and/or quantity of players. But why now? Why move Gallardo at all? He was drafted by the Brewers, after all. I’ve heard all this and more since the trade rumor was first floated out. To those questions, I answer thusly. Gallardo rebounded a bit in 2014 and actually had a better overall season than many give him credit for. He still struggled against St. Louis, had a poor May after an excellent April and limped through September when everything around the team seemed to be collapsing together, but his season was strong as a sum of its parts. Gallardo’s fastball came back to life and he posted a career-best BB/9 ratio of 2.5 overall. With a full season of control, Gallardo is more valuable to the Brewers to move now than he would be at any other point in 2015. And outside of the money issues, Gallardo is the most moveable piece among the pitchers. He’s the best combination of return, savings, and striking while the iron is hot on the team. You aren’t moving the cheap Wily Peralta, Mike Fiers or Jimmy Nelson. Kyle Lohse is the oldest of the group and wouldn’t bring as much in return since there’s less projectability left on his arm than that of Gallardo. And after bringing in Matt Garza on an expensive deal, that’s not changing yet, plus the fact that Garza is already on pace to providing an extremely inexpensive contract option. You also can’t let yourself worry about the fact that he was drafted and developed by the Brewers. So was Rickie Weeks. So was Prince Fielder. So was Corey Hart. There is a time for the vast majority of players in the era of free agency to move on from their original teams. If Gallardo isn’t in the long-term plan and he can bring you back someone who is, you move him. It can be a hard thing for a franchise like Milwaukee to do when homegrown talent under team control is a necessity to win, but when that talent prices themselves out of town decisions must be made regardless of the potential public relations hit. In a perfect world every Brewer is Robin Yount, but a perfect world this ain’t. As for the return, well that just might be another column once we learn the particulars. Rosenthal speculates that Luis Sardiñas might be involved, but as of Sunday afternoon Gallardo hadn’t even been informed that he’d been traded. A principal agreement could be in place without all the details sorted out. I’m told that Gallardo’s agent leaked the report though so somebody knows something. Understandably, both front offices are upset as the track record exists for both to operate quietly. In regards to the next step that so many people wanted to jump to on social media already, the agent for James Shields wouldn’t be doing his job if he didn’t reach out to the Brewers to discern their plan and see if his client might fit. After all, the talk for a bit now is how nobody is in on Shields at the number he wanted. Engaging the Brewers could get things a bit more towards where Shields would like them to be. Then again, the conspiracy theorists point to how shortly after the Gallardo news broke, the Nationals agreeing to a contract with free agent pitcher Max Scherzer came out. They are pointing to the coincidence to indicate that maybe the Brewers desiring to trade for Wisconsin-native starting pitcher Jordan Zimmermann and needed to free up a rotation spot and some money to do it and that now that the Nationals feel confident in trading Zimmermann, they could fully engage on Scherzer. While that’s all plausible, it certainly feels like a couple of steps past where things stand as the sun comes up on Monday, January 19th. Stay tuned. I have a feeling that things could get fun today.